Early in my entrepreneurial journey selling on Amazon, I received candid but critical advice from a successful private label entrepreneur. After a few first hand mistakes of my own, I never again took this advice lightly! My last post about coming up with private label product ideas gave you insights into one of the methods I take to generate keywords. To recap, I mentioned to you that product ideas are all around you. 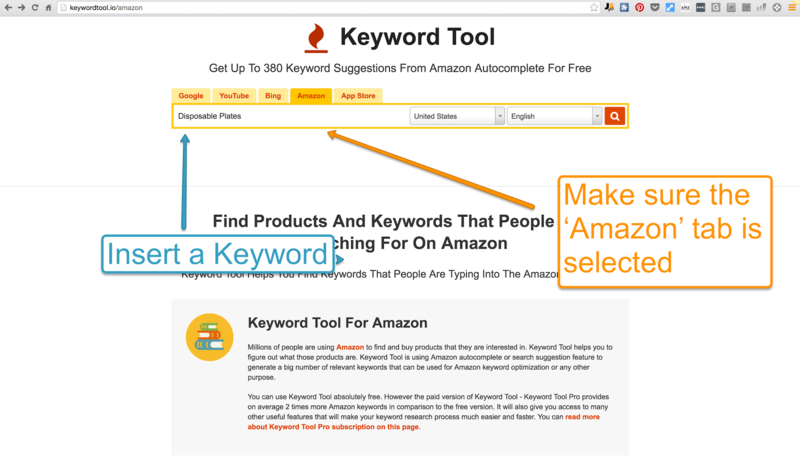 Your mission is to write down as many keywords as you can (by the end of the week I generate a list of around 30-40 products) and then dedicate a few pomodoros to each keyword to see where the search inside Amazon’s Catalogue leads to. This a great way to not only find private label opportunities but to always keep your creative juices flowing. But sometimes I want an unfair advantage over my competition. And this is where Niche Hunter is a gold mine. It allows you to power up your Amazon Private Label Research so you can find Niche opportunities in no time at all. I’ve personally fallen in love with some of the features. 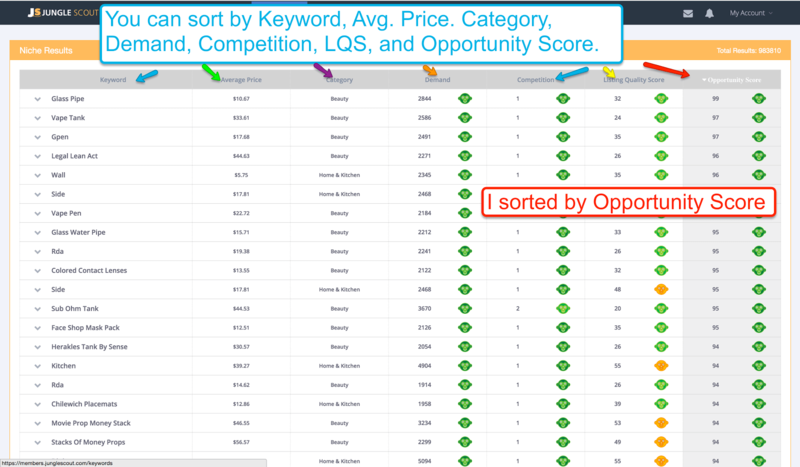 The Niche Hunter allows you to filter by Demand, Price, Competition, Listing Quality Score, and Opportunity Score. Let me go over a few approaches. There are so many ways I can take this search but I want to start super basic. I simply just click Enter and the Niche Hunter shoots back 983,000 results! The Breakroom Coffee Organizer caught my eye. This listing has a high volume of sales with a decent selling price of $19.99. However I notice more reviews than I would like. I also know that we have so much more products to look at. Let’s see if we can do a little better. During this search I excluded all categories except (Home & Kitchen, Patio, Lawn & Garden, Pet Supplies, Kitchen & Dining, and Home Improvement). 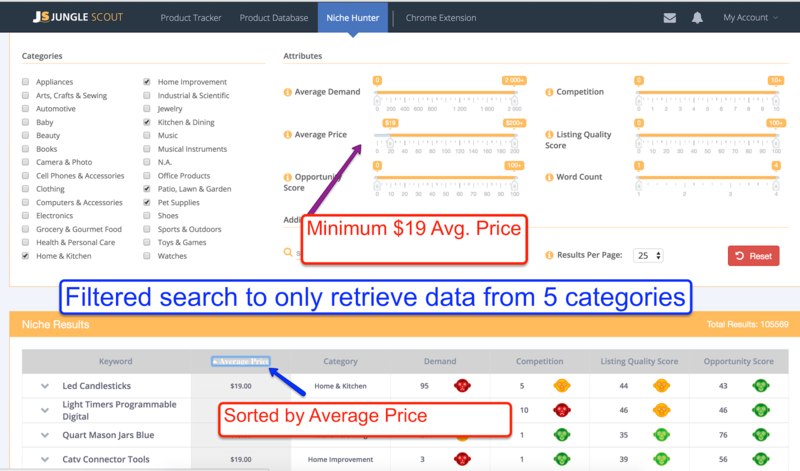 I also set the floor price at $19 and sorted by price in order to scan the data quicker from least to most expensive listing. Now we are getting down to business! 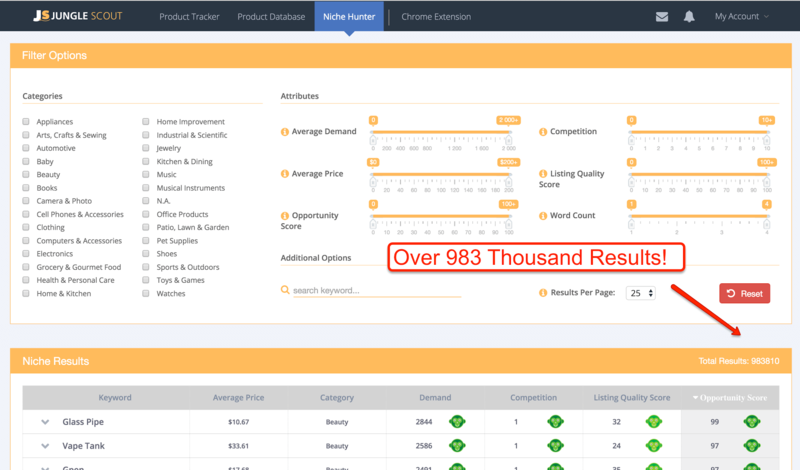 Here we have 105,000 returned results in 5 Private Label friendly categories. This is awesome! 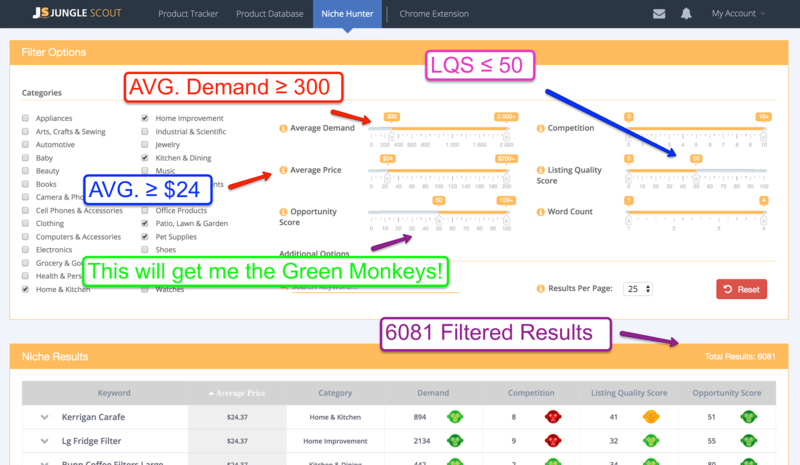 BUT I need to stop fooling around and get rid of these Red Monkeys in the Opportunity Score section. Possibility #4 We can turn those Red monkeys into bright Green ones! And while we are at it, let’s pull up successful products with a 70 or lower LQS score. Label and add better images, better content, and better keywords? Can it get any sweeter? Yes, absolutely! However for now I am going to stop right here and open one of these gems up. Quickly found a really cool disposable product. I love disposable and replenishable items because customers will keep coming back to restock. Don’t forget you can grab this keyword and plug it into Amazon.com and see what comes out of it. Pulling up the data from the Chrome Extension I validate that there is a high velocity of sales in this niche. 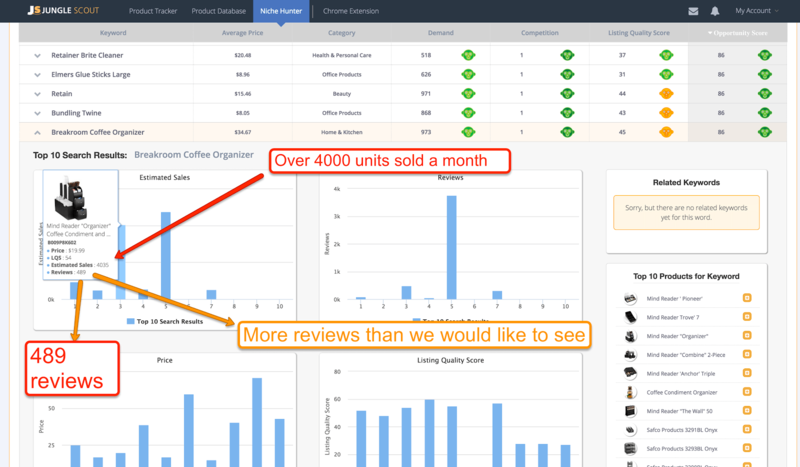 Some of the listings do have more review than I would like to see, however there is a successful listing selling thousands of units a month, with less than 50 reviews, and fulfilled by merchant. We can beat that! You’re probably concerned that some of the listings belong to Brand Names. And that’s okay. Let’s take a step back and go over the fundamental concept of Private Labeling. An example they use is that of Richelieu Foods providing (among other items) condiments for Sam’s club, BJ’s Wholesale Club, and Shaw’s Supermarket. Ask yourself, are you only looking to Private label products that have already been private labeled? If so, then you’re potentially missing out on thousands of opportunities. You don’t have to wait for an Entrepreneur to private label a product before you come in and private label the same product. Anytime you see a brand name or product that does not have patents or trademarks, it is fair game for you to private label. You could also do what Greg did in the previous post and plug in a brand name such as “Skilz” and as a result uncover long tail niches such as ‘Skilz basketball hoop indoor’. And to reiterate, he found the long tail keywords associated with this brand name, and used these new keywords to generate brand new niches not exclusive to Skilz such as ‘basketball hoop indoor’. Disposable Trays is just ONE of 6083 results we chose to look at. You can take the filter in any direction you want and as a result, get a completely different set of profitable product opportunities. Alternatively you may take the list you’ve generated during your pomodoro sessions and plug it in and quickly assess demand and retrieve related keywords and listings. I think this is still a fantastic way to research products. In fact, do you want to know a free and totally legitimate way to extract Long Tail Keywords? What can you do with these Keywords? Alternatively, you can have a Virtual Assistant (VA) take your Keyword list and plug them into Amazon. Then, the VA can report back only the products that meet your predefined requirements. I would advise heading over to Freeeup or Upwork to leverage virtual assistance to get your product research done quickly. Written in a easy to understand but knowledgable tone of voice – adding humor and a bit of fun is encouraged too! Our blog posts are generally quite visual, so we like to see images, graphics, charts, videos and other visuals throughout submissions. The post should be broken down into manageable sections with sub-headings. Aim for 200-300 words per section. Keep sentences short where possible. 4. After submission, I will submit the post for review internally at Jungle Scout and let you know when the publish date will be. Next post I want to cover the big picture which is the Product Database, a key feature in the Web App. How’s your product researching coming along? I’ve been watching the videos one by one. Do you have one for the Niche Hunter??? Its confusing me a bit. When I look at the products in the chrome extension, the numbers are different. especially when I use your opportunity checklist / scorecard. 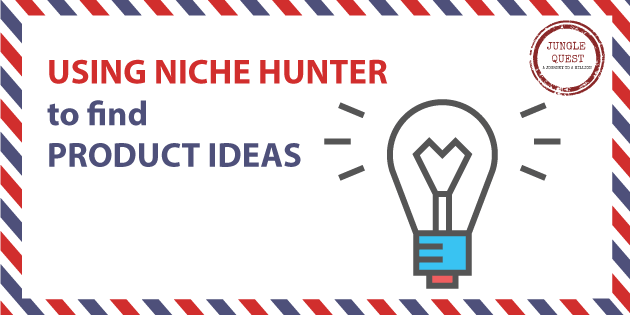 Do you have a different criteria for Niche hunter???? In the beginning it was my impression that I should only look to PL products that have around 3k-5k in Est. Sales for top 10. Seems like there is some leeway and perhaps 10k sales is fine for top 10(as long as it fits the review criteria). Is there a cap on sales for top 10? Is 10k too much? 15k too much? Can I private label any product as long as 1-2 sellers under 50 reviews in top 5, 3-4 for top 10? Thank you, looking forward to your reply. I currently have the Pro for Chrome but as I am in the UK I can not get the subscription… (I did sign up for it but then realised not for the UK) do you have any timescales for a uk release? Absolutely, I think the main point I want to deliver is that if you continue to dig in and spend time researching you will find something. 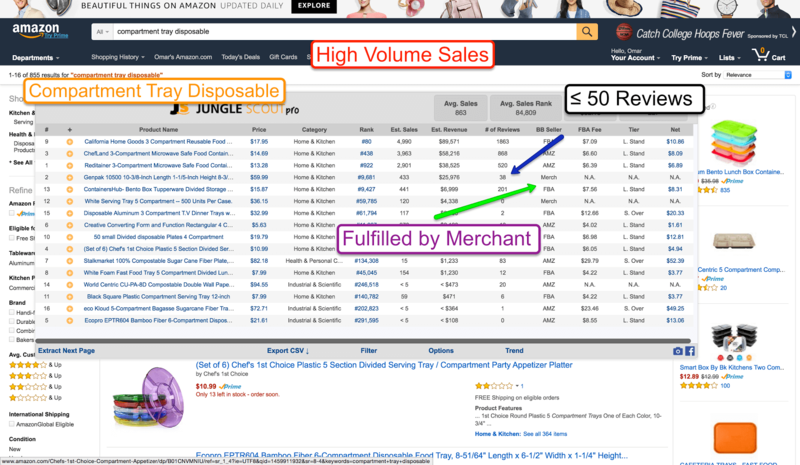 For example with this opportunity, it might not have met the requirements you mentioned, but you do see a 400 + velocity (sales) on a merchant fulfilled disposable product. The overall sales of the top 10 products are also above 3000 sales. 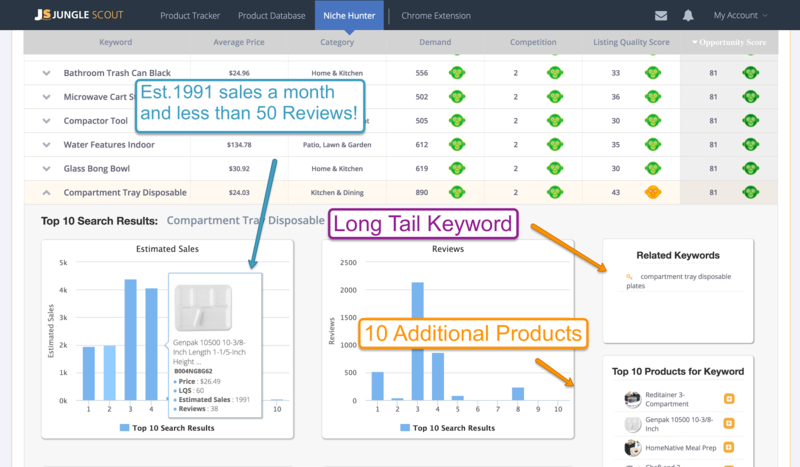 Based on JS Pro results for “Compartment Tray Disposable” search term you have only one seller in top 5 that sell more than 300 and have less than 50 reviews. The positions 6-10 are not sell more than 300 items per month. Greg always say that he want to see 4-5 sellers in top 10 with less than 50 reviews and all sellers in top 10 must sell close to 300 items per month. Based on that, can you please explain why “Compartment Tray Disposable” is an opportunity?